Lemon GreenTea: Epson’s in Style! Well, style trends come and go, but this revolution is so far-reaching, it’s set to rock the foundations of the fashion world for good. The game-changing development that is shaking up the industry is digital textile printing. Digital textile printing is pushing the boundaries and opening up new possibilities in the fashion world for apparel, accessories and furnishing. With this, designers are given free rein to pursue their creative vision, and are limited only by their imagination in their design, and to translate their ideas to fabric. This process unleashes design creativity, enables savvy brands to boost their image and helps retailers to meet their customers’ expectations, bringing the latest fashionwear designs from catwalk to the stores in a shorter time. And digital textile printing delivers the distinctive personal styles that today’s individualistic customers want. In the traditional industry model, designs are printed on fabric using silk-screen printing – a costly and labour-intensive process that can take weeks to produce a single order. Designers are heavily constrained in their ability to translate ideas into finished fabric, since the process requires the design to be engraved on mesh screens by highly skilled craftsmen, and then demands large minimum yardages before a rotary or flatbed printing job can get under way. In contrast, digital textile printing allows for fabric to be printed in remarkably small runs. And designs need not be just the stripes, dots or flowers we’re used to seeing, repeated across the garment in a limited number of colours. Textile designers today have absolutely no barriers to their creativity. Already using digital photography and technology such as Photoshop in the creative process, designers are working with source materials like original photography, copyrighted images and paintings, or even creating new designs to produce unique, breathtaking designs that can even be considered works of art. And there are no constraints on colors – screen-printed textiles typically average six to eight colors at most. With digital textile printing, there is literally no limit to the number of colours that can be used. The digital process is also giving designers the freedom to work with a wider range of fabrics, from the polyester family, as well as cotton blends, lycra, silk, nylon and other materials. 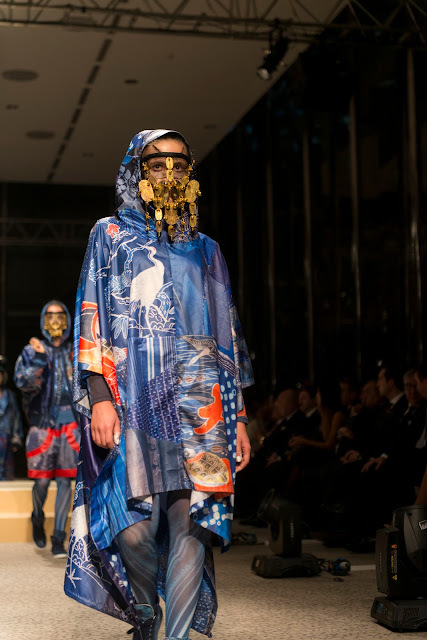 Recent season’s runway shows and major store displays demonstrate how high-end brands have embraced digital printing technology. For example, Helmut Lang’s designers have used their own photographs of unlikely-sounding inspirations like subway walls and peeling paint, to create unique, abstract designs for the brand’s collection of tops and dresses. Apart from its enthusiastic take-up by the major fashion brands, digital textile printing is also enabling new designers to spread their wings and bring their ideas to market. The technology provides an exciting opportunity for talented designers in our region and around the world to showcase their creativity – and printing technology leader Epson is offering them significant support. Working to exacting standards, Epson spent four weeks reproducing the designs with specialist Genesta inks on the Monna Lisa textile printing system developed by Epson-owned Robustelli of Italy, and on Epson's SureColor SC-F7170 series and SurePress FP-30160 textile printers. 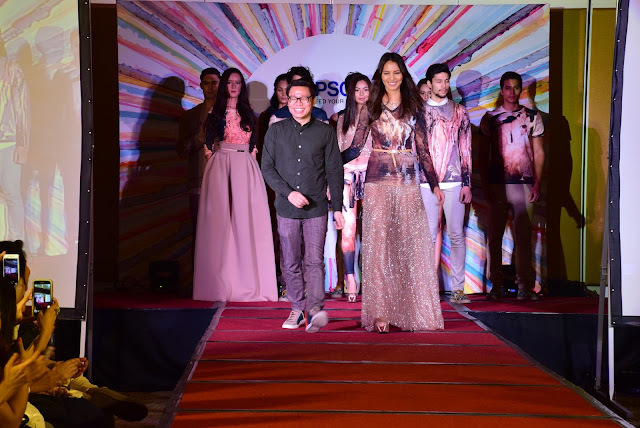 Last year, Epson staged its second Digital Couture event in advance of Fashion Week in New York City, showcasing collections from 11 North and Latin American designers created using Epson’s state-of-the-art SureColor F-Series dye-sublimation printing solutions. In Taiwan last November, Epson collaborated with designer Isabelle Wen to launch her new collection of couture clothing, with a segment of it printed by Epson’s digital textile printers powered by its PrecisionCore technology. Improvements in quality have been key to today’s widespread adoption of digital textile printing technology by the fashion industry. Incremental improvements in printers and inks have led to the longer-lasting, crisper prints we see today. From a production point of view, digital textile printing is often cheaper than screen printing – and it definitely facilitates faster turn-round, whether to enable stores to delight their customers with short run designs that are less tied to the traditional seasons, or to fulfil a one-off commission from a celebrity with an impossible deadline. For the manufacturer, digital textile printing brings greater business opportunity and agility, in enabling production across segments to meet the market demands – from apparel, furnishing and accessories, to providing a sample print preview to a brand before going mass production. A manufacturer can now produce everyday wearables alongside high end fashion in customised quantities; from interior furnishings such as curtains and sofa covers, to accessories such as tote bags and shoes. Production possibilities are only limited by the designers’ imagination. Epson is committed to strengthening its presence in textile printing and aims to provide products and services that surprise and delight customers in this market. Their advanced dye sublimation technology is helping designers create their own textile patterns in the exact design they want, when they need it, and in just the quantity required. Their new range of industrial textile printers offers maximum versatility for customised products on-demand – from stunning fashion items to creative interior décor. From the producer’s point of view, affordability is crucial; the Epson digital textile printer’s low cost of ownership and optimised performance put advanced production technology within the reach of visionary designers, helping them bring their designs to commercial reality in a constantly changing fashion world.